A Saturday night charity gala followed by a Sunday baby shower brunch meant hours and hours of high-heeling--and foot assaulting. And so, the moment I exited the door at shower-end yesterday, I unstrapped my stilettos and shuffled barefoot down the street toward my car. I must have looked quite discombobulated, for as a car approached, slowed down and then rolled past I looked up to see a couple (it happened to be Goldie Hawn and Kurt Russell) staring at me from within, with looks of grave concern on their faces. On the ride home, I naturally started thinking about flats, and how, when selected and styled just right, offer quite a bit of elegance minus all the torture. 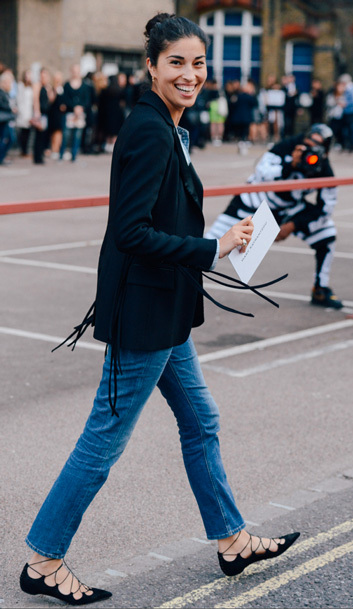 I'd like to take a cue from London-based stylist Caroline Issa, who stylishly flits from around in easy-to-walk-in yet dramatically elegant lcae-up flats. (Hers are by Christian Louboutin.) Some other lacy statements include this pretty ankle-wrap flat and this suede shoe, both from Aquazurra, this leopard print Gianvito Rossi, this Free People and this Jeffrey Campbell. Oh my gosh. love those flats pictured. wow, totally perfect. Loving those gorgeous lace up flats - they remind me of Irish dancing soft shoes back home in Ireland - probably the point/where he got his inspiration! !